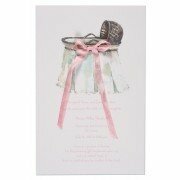 Size: 5.75” x 8.75” Includes: Invitations, Envelopes and Silk Ribbons Ca.. This 5.75" x 8.75" invitation features a large rattle and two large white daisies on a blue and w.. This 5.75" x 8.75" invitation features a large rattle and two large white daisies on a pink .. This two piece invitation features a pink teddy bear that fits inside a baby bag. White envelopes.. This 6" x 8" invitation features blue balloon with the words "Its Twins" on a pink and brown.. This 6" x 8" invitation features blue balloon with the words "Its Twins" on a blue and brown card.. 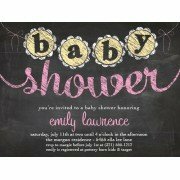 This charming 6" x 9' digitally printed invitation features a chalkboard with the wording Baby Sh.. This charming 6" x 9' invitation features a white rain cloud "showering" down on a polka dot umbr.. This 6' x 8" invitation is perfect for a baby shower or for use as an announcement. White envelop.. This 5.75" x 8.75" invitation is perfect for a boy sip and see party. White envleopes included. .. 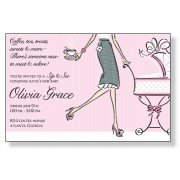 This 5.75" x 8.75" invitation is perfect for a sip and see shower. White envelopes included. .. This 5.75" x 8.75" invitation features the words "oh baby" on a purple and white stripe card. Per.. This 5.75" x 8.75" invitation features the wording "tickled pink" on a pink and white polka dot c.. There's no experience quite like throwing a baby shower. Whether the soon-to-be mommy knows about the event or it's a total surprise, we know that you just want to make it special for her. 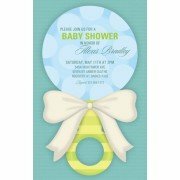 And because no two mothers are quite alike, we've got a huge selection of baby shower invitations so the design you choose will be as unique as she is. We've got cute designs so mommy's little girl can be welcomed into the world in style, or boy-specific baby shower invitations with every adorable theme under the sun. But it doesn't stop there – we've got just the invitations for you if you're throwing a gender-neutral celebration for surprise bundles of joy, and even special cards for showering twins with love. Even if you're having a celebration for both the new mom and dad to attend, we've got you covered. And when the event's all said and done and the new parents are swimming in gifts and necessities, we have tons of cute baby shower thank you cards to show your guests how much all their help is appreciated. Shop our cards below and be sure to find just the design you're looking for.